Emma Adams’ Animals is the latest play to benefit from Theatre 503’s commitment to staging new work by emerging playwrights. I t is an admirable philosophy and, judging by the near full house on a Wednesday night for an unsung play, one that appears to be attracting a supportive audience. For the regular theatre goer it offers a respite from the seasoned polish of restaged classics in central London theatres (that said I am now waiting sixteen months to see Kenneth Branagh in The Entertainer) and provides a welcome opportunity to simply enjoy the process of watching a story being told to you for the first time. Watching emerging playwrights is akin to entering a lucky dip. You buy a ticket knowing that for the 95 times out of a hundred you leave having watched an average play, eventually you will be in the audience watching this generation’s equivalent of Pinter’s The Birthday Party or Sarah Kane’s Blasted. Even if the play doesn’t quite hold together, there is still the chance to watch the formation of a new writing talent. This is certainly the case with Emma Adams’ Animals. It is a play that feels heavy with the influences of others and watching it provides an interesting chance to see an individual’s voice beginning to define itself. The slightly surreal characters and off-kilter language is reminiscent of Enda Walsh’s Ballyturk and Mistaman. Adams also appears to share Walsh’s love of telling a story and allows Animals’ dystopian world time to reveal itself. She is a very good story teller and recognises the art of withholding information, from the moment the stage reveals the ruined shell of a council block housing an older woman and her live-in help, we desire to learn more about how this world came to be. 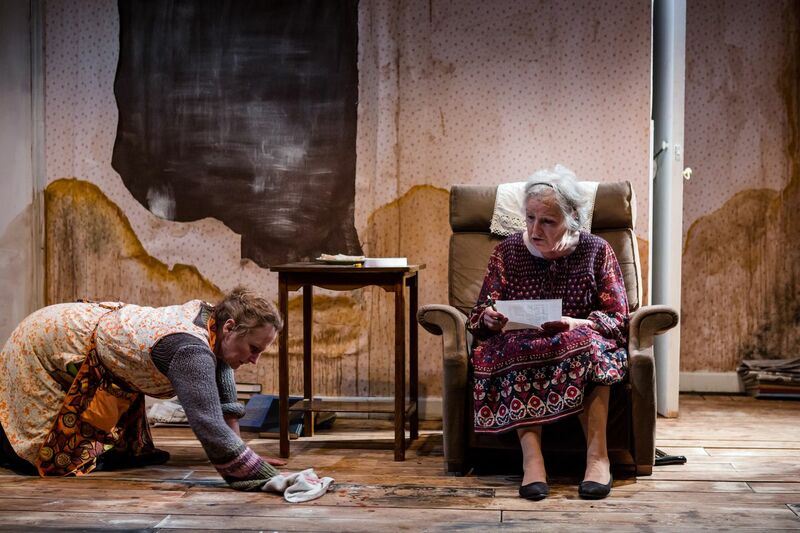 The blackly comic humour and the unexpected turns into grotesquery echo Martin McDonagh and the curious relationship between Joy and Norma feels familiar to those who have seen The Beauty Queen of Leenane (one of the most accomplished debut plays that I’ve ever seen). Dystopian future-world have been explored in great depth through literature and the way that information is kept tightly controlled from the next generation, and the role of women in particular, appears influenced by Margaret Atwood’s classic The Handmaid’s Tale while the role of the father is familiar from Orwell and many others – the implacable agent of the state diligently doing a terrible job for the greater good. Despite the influences of others, the world Adams creates in Animals is all her own – for better and for worse. 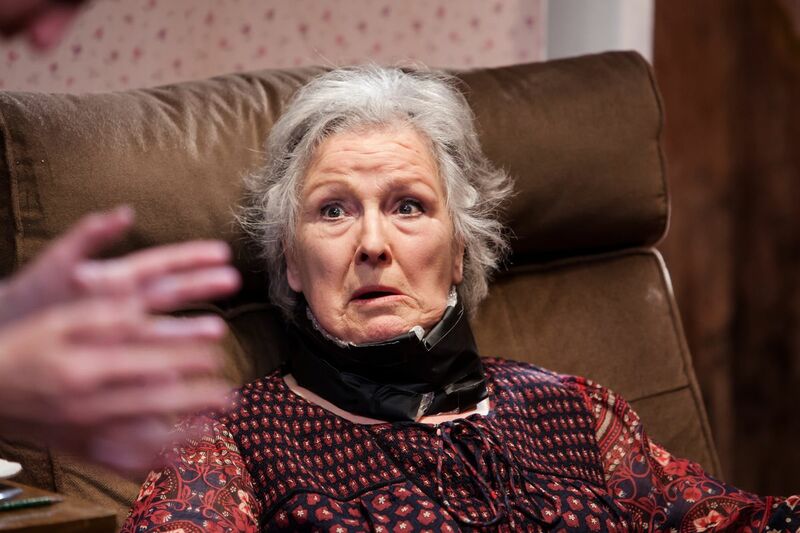 Possessed of an inventive mind, the play is stuffed with good ideas; a ban on talking about weather following a catastrophic event, the sense of communities closing ranks as civilisation regresses and an acknowledgement that older people can play a dynamic role in modern drama. These are all interesting themes to work with. However there are times that the inventions could be reined back to ensure the central drama retains its focus. A number of ideas are picked up but are never developed into elements of a fully realised future world. We don’t gain a strong conception of why we have reached the state we are at. There is no obvious sense that civilisation – even in the face of catastrophe – would have descended to the point of sending people around with a license to involuntarily euthanize people for not carrying around the right permit. Equally the role of children in this society is highly prized. They are insulated from the realities of the world and education involves fairytales taught as reality. The problem is that it is never seriously explained why this would happen. This isn’t a post-apocalyptic scenario where humanity exists in a Mad Max settlements. The infrastructure of society remains – including what appears to be a functional, if rather militaristic, central authority – and one presumes the internet has survived. The play is set in 2046 – it is only 30 years away – so the audience must believe that all has happened within one generation. This need not be a problem if the audience could sit back and just enjoy the story unfold. However these issues are symptomatic of a general looseness that recurs through Adams writing, which results in Animals clocking 2hrs plus an interval. It takes time to pick through all the plot strands, and there is an overreliance on exposition which can cause some dialogue to become leaden and the play’s pace to slow. The characterisation suffers from a similar looseness. 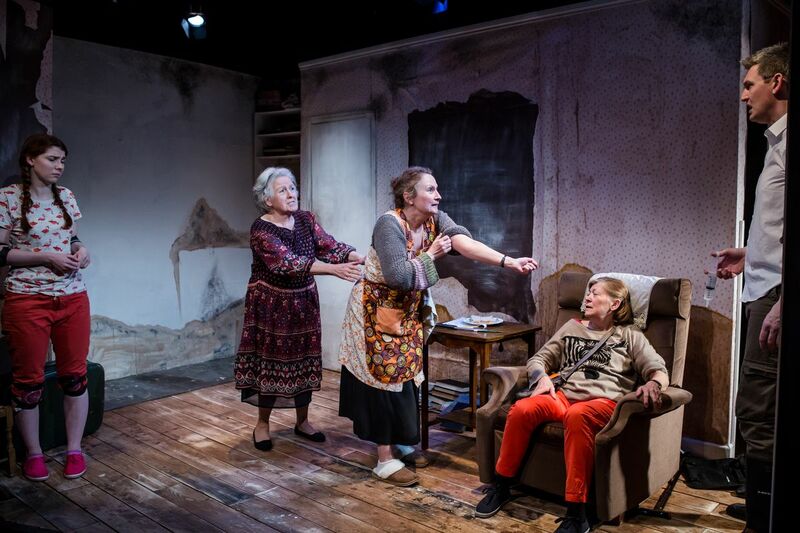 The older people were dealt with sympathetically and the dynamics between Joy, Norma and Helen are strongly evoked. One can see that within this play there is a really tight, 60-min three hander that explores the key themes but with a precise focus on the older characters and how/why they are in the position they are in. Unfortunately Maya and Noah (a possibly too-cute piece of naming given the nature of the environmental catastrophe that appears to have taken place) feel far less alive. Milly Thomas does her best with some uneven writing and brings a sense of innocence and unconscious entitlement to Maya, which helps bring some tonal balance. Unfortunately Noah is a plot device rather than a character and Steve Hansell is often left to step in to, rather laboriously, explain the various bureaucratic features that totalitarian governments always love so much. However the central performances from Norma (Marlene Sidaway), Joy (Sadie Shimmin) and Helen (Cara Chase) are splendid. It is depressing how rare it is to see older actors on stage – apart from big names doing big plays – and when they do they are applauded for just turning up. Angela Lansbury in Blithe Spirit? A fine performance but an award-winning one? It is almost as embarrassing as given Dame Judi Dench the Oscar for 8-minutes of screentime in Shakespeare in Love. However Adams has written strong, powerful, meaty roles and they are done justice. The timing was tight to allow the comic interplay to flow, and there was a sense of a shared history between the characters, of lives that were being lived offstage. 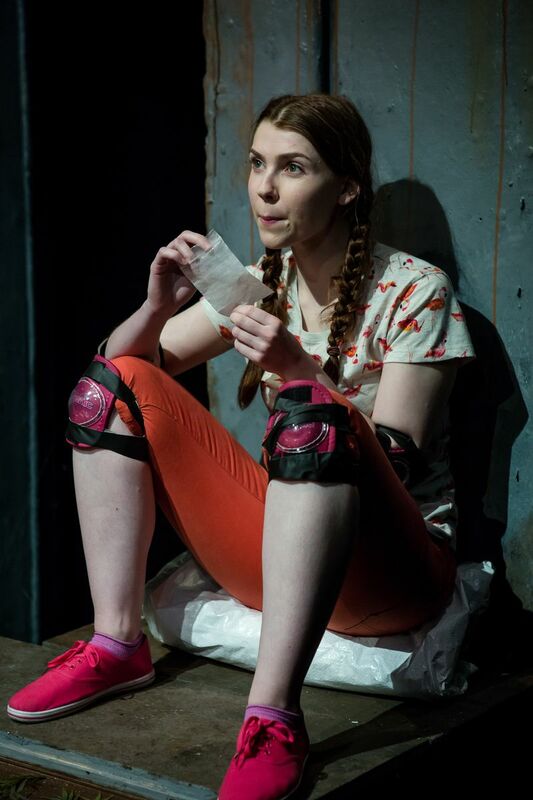 Overall Animals is the sort of mixed bag that should be expected from an emerging playwright. One does not enter the world fully-formed and one should not expect the same in the theatre. Importantly Emma Adams has strong ideas, and that is more refreshing than the conveyor belt of identikit writers emerging from creative writing classes around the country. Emma Adams is a talented, thoughtful writer and is one to watch even if Animals isn’t likely to be the work that will make her mark in the world.